(this can be reduced a bit further but that's not the point). The plot of both my "manual" product rule derivation and the "weird result" actually gives the exact same curve. 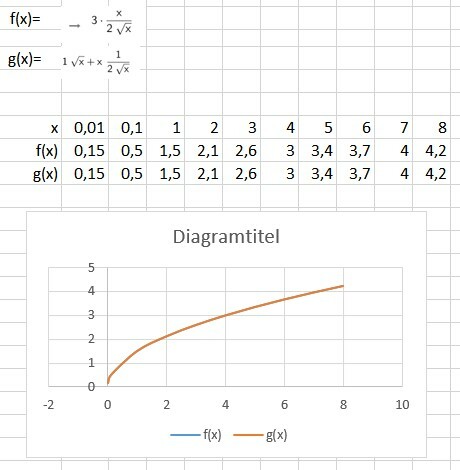 Indeed, using Excel to simulate the formulas also confirms that "manual" product rule equation gives the same values and curves as the GeoGebra f' result. Last edited by skipjack; April 7th, 2019 at 11:20 AM. I think you'll feel a bit silly when you see the answer. It's precisely the opposite of what is usually done. You should have simplified it. Wow! Busy on the Forum this afternoon!